We spend a lower percentage of our incomes on food than ever but what we eat dominates the media, whether it be this year’s winner of The Great British Bake Off, Tesco’s latest marketing rip off or the travesty of food wastage. Campaigning chefs such as Jamie Oliver have done much to raise our awareness of good quality food, including the benefits of grass-reared beef and lamb and the taste of proper free range chicken. But the fact remains that our upland farmers struggle and their story is heard only infrequently. Beyond the bubble of Guardian readers with their organic veg boxes – I’m one by the way – when the push comes, the dollar is the bottom line for most of us. While he may not yet have had the same impact on our perception of the countryside as the presenters of Countryfile, James Rebanks challenges us to rethink our understanding of farming and humans’ relationship with the land. He is not alone, and the story he tells is not without precedent. But the @herdyshepherd1, as he is known to his 70,000+ Twitter followers, has done much to educate about the realities of upland farming. He is both a shepherd – a fell farmer, steeped in the traditions of a remote part of England – and a writer. His Illustrated Herdwick Shepherd is a simply beautiful fusion of word and image, with grainy, gritty photographs revealing the realities of farming. Meanwhile, The Shepherd’s Life has been the unexpected success of the year, most recently as Waterstone’s Book of the Month, and it has already been translated into a dozen different languages. Rebanks’ success unquestionably rests at least in part in the quality of his writing: there is both brutal honestly and exceptional readability. This is frank, earthy writing, aware of the beauty and lure of the landscape and way of life about which he writes, but it’s stripped of sentimentality and often self-critical. Any quibbles? Plenty. Like most writers these days, ‘strong’ language equates with ‘strong’ feeling. But the success comes, too, from the highly personal nature of the book. The Shepherd’s Life is in some ways a memoir of Rebanks’ own story, revealing his tumultuous yet ultimately loving relationship with his father, like him a shepherd. He tells, too, of his own school failure, being saved by his wife Helen from a life of violence and drinking, of his evening college classes leading to an Oxford education, where he never quite fitted in. Indeed, lurking all the time for Rebanks is the lure of the land and the need to be doing ‘something’ with animals, for like the sheep he farms, Rebanks is ‘hefted’ to the land: deeply attached through the process of farming. Indeed, it is arguments about sheep that determine all too often his relationship with his father. Now, like so many other farmers, technology enables Rebanks to combine fell farming with writing and working as a consultant in sustainable development. But this is not a conventional autobiography of bad-boy-turned-good, though there are elements of this, nor is it simply a record of the life of a farmer. It is much more, combing the personal and the political, the story of a family with that of a whole community and even culture, alongside a portrayal of the intricacies of the particular farming patterns of the Eden Valley on the fringes of the Lake District (by strange coincidence I’m writing this while on a train from Glasgow to Birmingham, skirting the landscape he describes). It is this fusion which gives the book its particular force. A Shepherd’s Life is framed around the farming year. It is a cyclical story, of patterns laid down over centuries, of moving stock from fell to lowland, of returning stock to the fells and of the need always to be breeding, keeping the next generation alive. We learn of the abundance of summer, when haymaking becomes a priority in order to prepare the farmer for the year ahead. We are taken through the Autumn, perhaps the high point in the shepherd’s year, when the best sheep are taken to agricultural shows and prizes greedily fought over, when sheep are rounded off from the fells and sent on to market and when tups (rams) are let loose on flocks to ensure next year’s lambs. We are told of the dark days of winter and the battles to ensure that sheep are fed and checked on in drifting snow, and, more than anything else, sheep and farmer must contest with the incessant rain. It is at such times that the Herdwick sheep that Rebanks farms come into their own, remarkable in the way that they are able to survive on Spartan diets in the wildness of the fells in a way which more modern breeds fail. And finally, we experience the joy of Spring, when, despite the ardour of lambing, there is a sudden sense of life returning. All of this is placed in the context of a culture of shepherding, in which honour and reputation is as important as wealth. 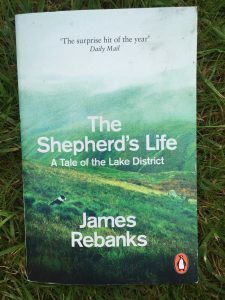 Rebanks is at pains to show that this is quite different from the ‘simple’ shepherd of pastoral mythology and the poetry of Wordsworth, who more than any other writer, has shaped our understanding of the Lake District. Rebanks (by no means the first to highlight this) demonstrates that the fells are not a ‘wild’ landscape but the result of sheep farming over centuries, and rarely grasped by outsiders; some of the most memorable parts of the book include the times when non-farming cousins visit with their ideas about the Lake District as a place of leisure. Indeed, Alfred Wainwright, whose guidebooks continue to describe the fells for hill walkers, never mentions the farmers whose Herdwick flocks have fashioned the landscape tourists now enjoy. Others, however, such as Beatrix Potter, understood that the Lake District needed Hardwick sheep and shepherds to survive, and it was this that led her to purchase upland farms for the National Trust. In fact, we learn, shepherding requires a deep knowledge which Rebanks argues requires as much intelligence as any career in academia, vociferously claiming for the farmers he has known over the years have as much intelligence (and probably wisdom) as many of the intellectuals he has encountered. Indeed, at core, the power of The Shepherd’s Life is how it challenges our perceptions both of humans and of landscapes in areas such as the Lake District. Are we to see a ‘wilderness’, a playground for those eager to escape urban life? Or are we to acknowledge the intimate relationship between humans and this most ancient of landscapes over many centuries? Is it even possible for a landscape to exist without people? Right now, in an age when so many of us are divorced from the land, when so few have a deep understanding of food and how it is produced, when so much agriculture is verging on the industrial, I can think of few better reads. ← Poetry – Have I been teaching it all wrong for 18 years?